Back in June, President Obama signed a law requiring cigarette manufacturers to display health warnings on the top half of cartons, and to cover the top half of the fronts and backs of packages with "color graphics depicting the negative health consequences of smoking." Big Tobacco was not amused. Three of the four biggest cigarette companies have sued. R.J. Reynolds Tobacco, Lorillard (LO) and Commonwealth Brands argue that the "shocking color graphics" would require them "to stigmatize their own products through their own packaging." 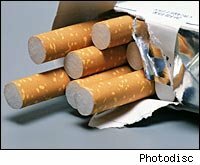 But the tobacco companies make a puzzling argument in their complaint: "These speech restrictions are particularly egregious as the population has, for decades, been well informed of the harms of tobacco use and the government cannot demonstrate that the restrictions will further increase consumer awareness or reduce youth tobacco use." The tobacco lawyers seem to want it both ways. If they don't think the new regulations will increase consumer awareness or reduce youth tobacco use, why are they spending huge amounts of money (and generating negative publicity) fighting regulations that, they argue, won't make any difference? Actually, the fact that the tobacco industry is mad enough about the regulations to sue suggests that it's actually a very good law. And changes to packaging design are only one part of the new law. Tobacco companies will also be banned from advertising within 1,000 feet of schools and playgrounds. They won't be allowed to run color advertisements in any publication with more than 2 million readers under 18, or with more than 15 percent of its readership under age 18. These are pretty obvious efforts to limit the exposure of children to tobacco advertising, but the lawsuit complains that they will restrict advertising in People, Sports Illustrated, and ESPN the Magazine. Event sponsorships are also more tightly regulated, and tobacco industry scientists won't be allowed to discuss the notion of "safer cigarettes" in public forums until the FDA has made some ruling on whether they are good for society at large. Altria Group (MO) -- the parent company of Philip Morris -- was, to its credit, the only major tobacco company that supported the legislation and did not participate in the lawsuit.